I've brought some servos to convert to continuous rotation for some school projects that I'm planning. The servos are TGY-90S from hobbyking. I used to use these in Fury Jr and they worked great. 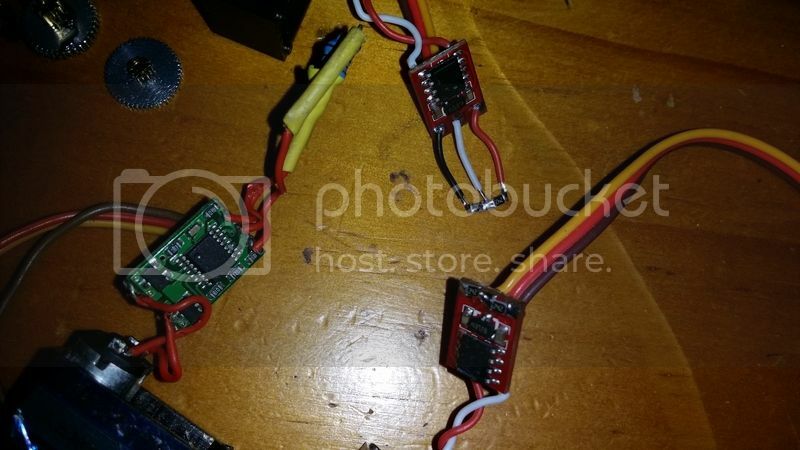 This time I got some surface mount resistors to make things more tidy, as per this website https://learn.adafruit.com/modifying-servos-for-continuous-rotation/overview , however I am having issues. I have noticed that the servo board is different in the original Fury Jr servo, but I don't think it is a problem. My multi meter measures 2.55k ohm on the servo pots at centre position and the resistors that I got are 2.4k ohm, 0805 , +/- 1%. I checked with the multi meter and all the resistors measure correctly after soldering, so I didn't kill or bridge over any of them. Should I go off to Jaycar to buy new resistors or is something else the problem? What is the behaviour if you leave the pot soldered on and just pop out the motor? I removed the gears so the motor turned without moving the pot and got the same result. I adjusted the pot so the motor would stop when the stick on the radio was centered, it worked but didn't have speed control. Now I'm thinking these servos are rather touchy and my resistors aren't matched. I need to learn to use my multi meter better, because the resistors did seem matched to me.